This is a module of adblock program Adguard that allows you to protect your child from internet threats. This module checks web-pages that children are visiting and blocks unsafe, inappropriate resources and adult websites. Why do you need Parental Control? We live in the century of information technologies – every schoolchild has a mobile phone or smartphone and even pc (mac or windows), many parents even buy tablet computers for their babies. Without a doubt, children today are confident users of computer and the Internet – almost all of them have accounts on the online services when they are ten years old. Statistics show that this is the average age at which children begin to use social networks by they own. Ten years! And it is not surprising that parents who at first allowed their child to use the Internet, soon begin to realize that there are a lot of the dangerous and inappropriate for children websites, that are all around the world web and there is need in kid control. Now this problem is really topical. Of course the Internet can be very useful and even contribute to development of a child, but along with it, one should consider the risks connected with the promotion of adult or illegal materials that a child with still unformed understanding of some things immediately remembers. Concerned parents have two choices - to forbid the child to surf the internet at all (that as you understand is highly unlikely and even impossible). Or to protect the child from dangerous sites and pages with content that is inappropriate for children. 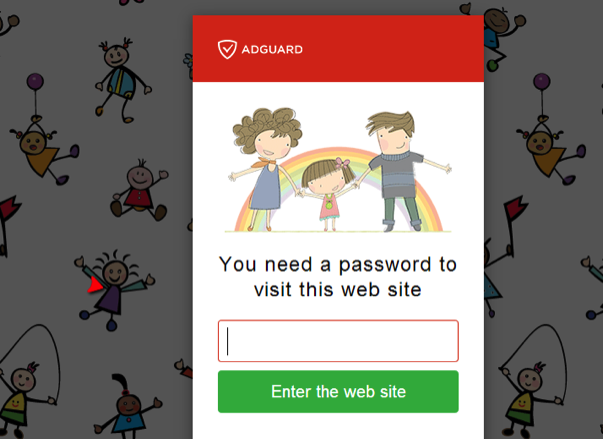 Parental Control module of Adguard was created just for that purpose, and in this review designed especially for parents we will tell you about it. How does Parental Control software work? The first thing you need to do after the installation of Adguard and configuration of Parental Control is to protect the program with a password, so that your child couldn’t bypass the access restrictions that you imposed. Then you select the user that our module will protect. And adjust the sensitivity level. The sensitivity level determines access to which websites will be allowed or not. In fact, it determines the level of filtering – how thorough the filtering of websites will be for this particular user. 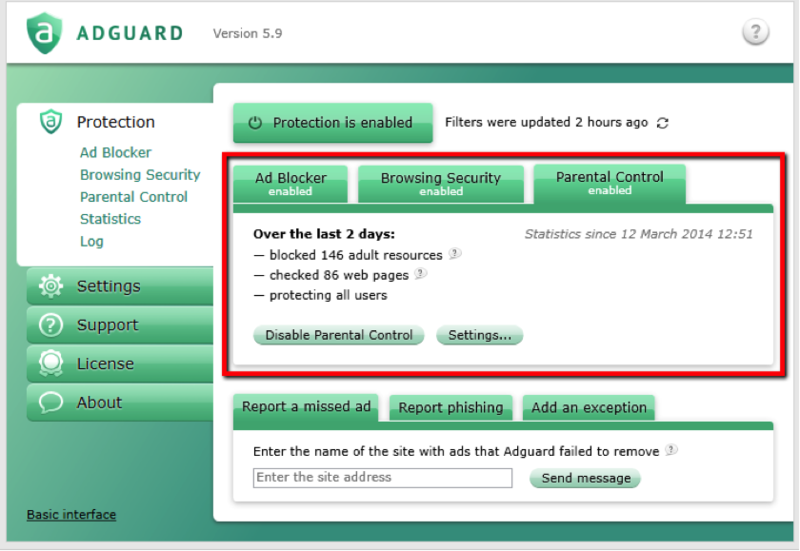 So, what is included into protection of Adguard Parental Control? Safe Search. Adguard will control everything your child is looking for in all the popular search engines – Google, Yahoo, Bing – and remove adult resources from the search results. You can forbid the load of executable files. This means that child control will prohibit any downloading to the computer. We have already mentioned the sensitivity level. You can choose protection from three levels: for a child that is 3 years old, 10 and 13. The younger the user – the stricter the filtering. If you think that it is still too early for your child to use certain social networks or visit some specific sites - you can add the URL (address) to the black list. White list is a reverse tool that allows to include the website to the exceptions. Password protection. Viewing sites will be limited. You child will be able to visit it only with your permission. Whether these pages are safe for children or not – that is for you to decide. We recommend to create a standard user account for your child. As an administrator you will be able to control fully which sites your child visits on the Internet. You can find the instructions on how to do this on the Microsoft official website, just choose your operating system (Windows 7, Vista, 8, 8.1) on the right. Parental control of Adguard adblocker will make Internet safer for children and give the parents “peace of mind”. You can see how our Internet censor for children works by downloading for free of trial version on our official website.